... I finally had a chance to sit down and listen to this recording, and it is.....GREAT. I don't say that lightly. Anybody who is interested in current acoustic string music will find a lot to love and a lot to explore... bears MANY repeated listenings. Barry Phillips really did something great with this truly international State-of-the-art album. Thanks! this is the kind of thing that makes my job feel necessary. 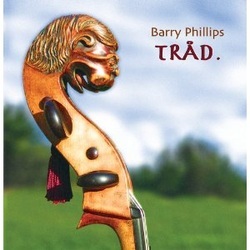 Music for baroque instruments by Barry Phillips, Lou Harrison and William Bird - all east/west cross-overs. Thirteen tunes form the 60's for cello ensemble. These songs have stuck with me since they were new and I'm always amazed how inventive so much of the music of the 60's is. I did my best to play these like a band would, not a classical ensemble. On the other hand, the overall sound it that of a live ensemble performance with very little effects added (occasionally a little echo or compression). Happenings Ten Years Time Ago - Incense and Peppermints - Rope Ladder To The Moon - Laléna - Ruby Tuesday - Sunshine Of Your Love - Hello Goodbye - Surf's Up - Tomorrow Never Knows / Rain - Voodoo Chile - Within You Without You - Woodstock - People Get Ready. "I love this album! It's energetic, beautiful, and also a bit tongue-in-cheek, with Barry playing with just as much "distortion" (in this case created with his bow) as Hendrix would. 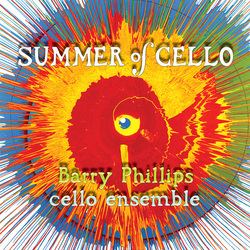 The thing that separates Barry Phillips from other cellists/string arrangers covering pop music is that he's a cellist with a truly broad spectrum of experience, from folk music to rock to Western and Indian classical traditions, so he's coming at this music from many different angles that inform the playing, the voicing, everything. Yet it's very laid-back and in no way pretentious. His approach is just so natural - it's obvious on these tracks that his love of 60's psychedelia is just as part of his musical upbringing as his classical conservatory training, if not more so. While, in my personal experience, most classical takes on pop music seem a bit too novel and almost cheesy - as if the musicians are peering into an alien world they are fascinated by, but don't quite understand - "Summer of Cello" is an entirely different animal. These cellos know how to rock." "To me this music reaches way up the scale in its quality of performance & in originality of sound & how I feel listening to it. Barry Phillips is a bit daring to follow his own creative path within & between many musical traditions that can be sensed in his music. It is simply beautiful." Instrumental tunes & airs from Ireland, Scotland, Sweden, England, Spain, American Shakers. Guest musicians: Shelley Phillips, Martin Simpson, Muireann Nic Amhlaoibh, Todd Phillips, Bickram Ghosh, Chris Caswell, Shira Kammen, Theo Page, Neal Hellman, Jared White, Lars Johanesson, Harris Moore and Karuna Ault. Bràigh Loch Iall - Aoibhneas Éilís Ní Cheallaigh - Lochaber No More - Old Heddon Of Fawsley - O Ho The Pretty Chain - Gycklarpolskan av Peter Erson - Cantiga de Santa María #206 - Trotto - Caoineadh an Spailpín - I Love to See the Wheels in Motion - Shto Mi E Milo - Ladom Se, Goro Zalade - Polska efter Pelle Fors - Thugamar Féin an Samhradh Linn - Inis Oírr. 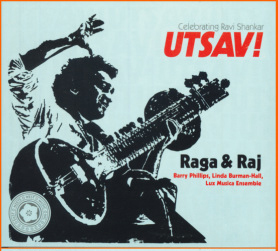 Performers include Anoushka Shankar, Lakshmi Shankar, Vishwa Mohan Bhatt and many others, performing short versions of ragas created by Ravi Shankar. The final raga is Tilak Shyam performed by Barry, Anoushka, Shelley Phillips (harp) and Bickram Ghosh (tabla). 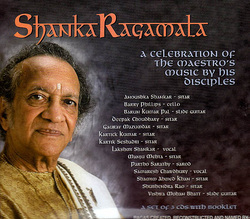 This 3-cd set was produced by Barry Phillips under the direction of Ravi Shankar. This is a stunningly wonderful house concert given by Ravi Shankar and Alla Rakha in LA just one week after Woodstock (audience present were all 4 Beatles, Peter Sellers and many others). I had the pleasure of restoring this recording for the cd. The orchestra at AIR was an experiment lab for Ravi Shankar. Here are 10 peices he composed and recorded with that orchestra. The recordings were in very bad shape, but I had the pleasure of restoring these recordings for the cd. 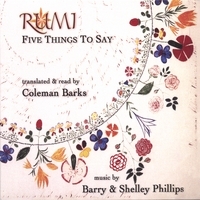 Coleman Barks reads Rumi with music by Barry and Shelley for their second cd all together.. A fine studio recording. 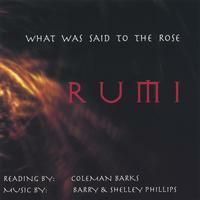 Coleman Barks reads Rumi with music by Barry and Shelley. A fine studio recording. Instrumental versions of shape note tunes. Three CD set including Simple Gifts, Tree of Life, and Music on the Mountain. William Coulter & Barry Phillips ... Music of the Shakers Volume 3. William Coulter & Barry Phillips ... Music of the Shakers Volume 2. William Coulter & Barry Phillips ... Music of the Shakers Volume 1. Recorded live at Carnegie Hall 2000. "The songs are mainly drawn from the English tradition, with fantastic vocal and instrumental performances from Martin. Guests on the CD include another Folk Great, Martin Carthy in their first ever collaboration, one of England’s best accordion players Chris Parkinson and the wonderful American cellist, Barry Phillips." The Expendables doing their stuff "acoustically" and I'm happy to be a part of this. I arranged and played the cello parts on "Positive Mind and"Die for You. "With an outstanding guest list on the album of Danny Thompson on double bass, Andy Cutting on melodeaon, Barry Philips on cello, Alistair Anderson on concertina and Northumbrian Pipes, plus the supreme vocal talents of Jackson Browne, Kate Rusby and Kellie While." "I was there to assist Ravi Shankar with the notating of his amazing piece "Arpan" that began the concert as well as play cello in the Indian Orchestra which was such a joy. Amazingly, a day or two before the show Eric Clapton decided he needed one more cello in the Beatles 1/2 of the show! - happy me!"